The exhibit “Jennie’s Baskets: The Daggatt Family Collection” will be on display at the Cannon Beach History Center and Museum (CBHCM) through mid-July. This rare collection of baskets has not been displayed for over 20 years. Jennie Michelle and Jennie Williams were Clatsop basket makers who produced an extensive body of work. Jennie Michelle married a Seaside settler named Meschelle Merchino in the 1880s and died in 1905, leaving behind a legacy of basketry and tourist photos. During her later life, Jennie was wrongly touted as the “last Clatsop,” and was featured in many black and white photos surviving to this day. Jennie’s artisanship and productivity as a basket maker were both noteworthy. 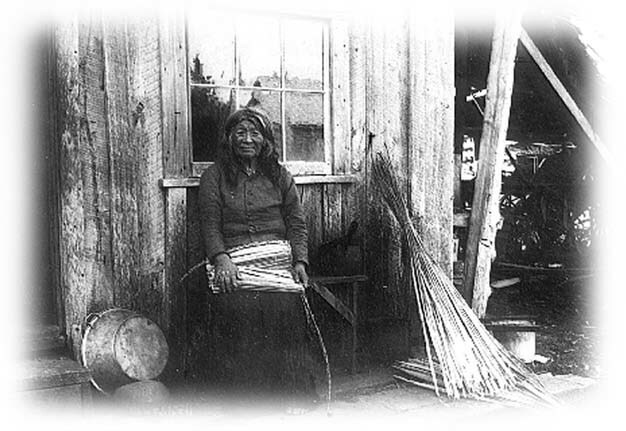 Less is known about Jennie Williams, a Clatsop basket maker who lived in the Seaside area until her death in the 1930s. The basket collection on display belongs to the Daggatt family who own a home in Gearhart. The Brown-Daggatt family, Walter’s mother’s side, built a beach house in Seaside in 1906, and began collecting Native baskets thereafter. According to Walter’s mother, the family would buy berries from the Clatsops residing in the area that came packed in hand-woven baskets. Berry-buyers would be given the choice of buying the baskets along with the berries. Thus the Brown-Daggatt family acquired the first baskets in their collection. These early acquisitions included baskets made by the Native residents of the Seaside area. Other baskets acquired by this means were made from non-Clatsop tribes who gave the baskets to the local Natives in trade. The Daggatt family continued to build their collection of Native baskets over the course of decades. A number of baskets in their collection were purchased from the Smith family of Seaside. The Smiths were descendants of Clatsop County homesteaders and had a house in the area known by settlers as the “Indian Place”—a site located just north of present-day Seaside High School. According to Walter Daggatt, Jennie Williams lived in a small building on the Smith’s property. As a result of their association with Jennie, the Smith family acquired many Native baskets, including works handcrafted by Jennie. In the 1970s, the Brown-Daggatt family bought the basket collection from the Smiths, thus adding to their own collection.